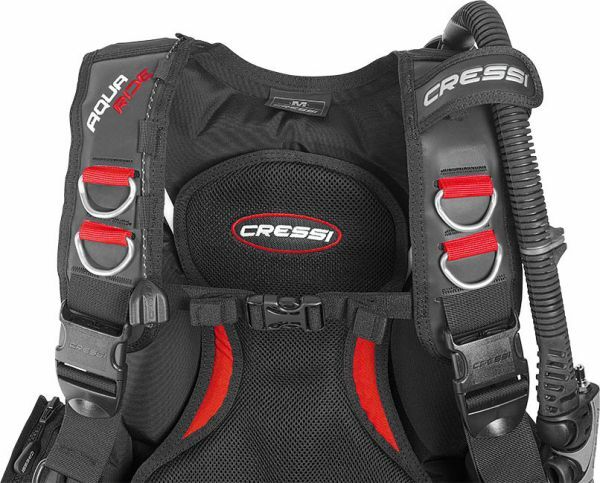 Aquaride is a high end Designed BCD with a special feature for divers who want a bit more: it has adjustable shoulder straps that aren't restricted by the air cell, improving the grip on the tank and improving comfort. Thanks to their anatomical, preformed profile, they are much easier to put on and make resting the tank more comfortable on the shoulders. The BC features the Flat type Lock Aid System of integrated weight. It is very effective and comfortable thanks to its extremely flat profile and the easy and intuitive arrangement of the pockets. Finally, the anatomical control has a hose retainer, making all inflation and deflation operations very easy and intuitive.